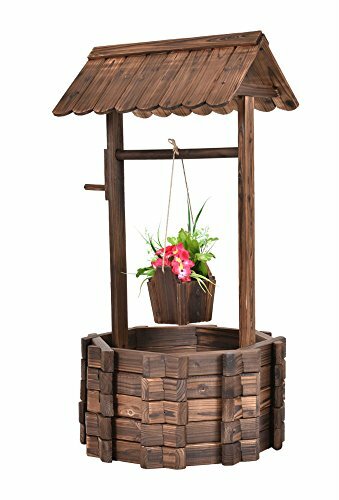 Specifications Color: as picture shows Material: fir wood Overall Dimensions: 22.0"x22.0"x44.9"(LXWXH) Top Hut Dimensions: 21.6"X16.1"X7.4"(LXWXH) Bucket Dimensions: 8.5"X7.5"X6.5"(LXWXH) Well Dimensions: 22.0"X22.0"X11.8"(LXWXH) Rope Length: 37.8" Weight: 23 lbs. Look at this stylish and beautiful wooden wishing well bucket planter. It will be a excellent decoration to your lawn, backyard, garden and other outdoor living space. This big well allows you to plant your favorite plants and flowers in it, and the bucket is also designed for planting. The wishing well is constructed of solid fir wood that will keep this planter lasting through the season for many years, and it has a burn wood finish for a rustic appearance. Do not hesitate to buy a one to add beauty to your garden.